Easy version of this Southern favorite! There's nothing like being able to throw your dinner into a crock-pot and forgetting all about it until you hear a bing, 8 hours later. This is especially true during the super stressful, hectic holiday season. Instead of worrying about what to serve your family while you try to clean up the wrapping paper, let the crock-pot do all the work with this easy Brunswick stew! A Southern tradition, this slightly spicy, full-bodied stew will warm up your bones and save you a ton of time! Traditional Brunswick stew is made with a hearty tomato base and then filled with vegetables and gamey meats, like rabbit. However, we know rabbit isn't easy to find so you can sub in chicken, pork or beef. We love chicken since it's a lighter meat and a crowd pleaser. Because the broth has a bit of a kick, serve this over rice or egg noodles! Place all of the ingredients into the ceramic basin of a crock-pot. Heat on low for about 6 hours, or until the chicken is fully cooked. Remove the chicken breasts from the crock-pot and place into a bowl. Using two forks, shred them into bite-size pieces. Place the shredded chicken back into the stew. 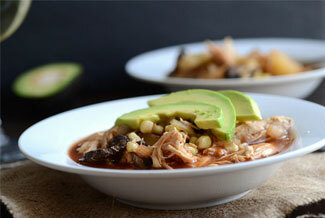 Heat another 30 minutes and serve immediately with chopped avocado!